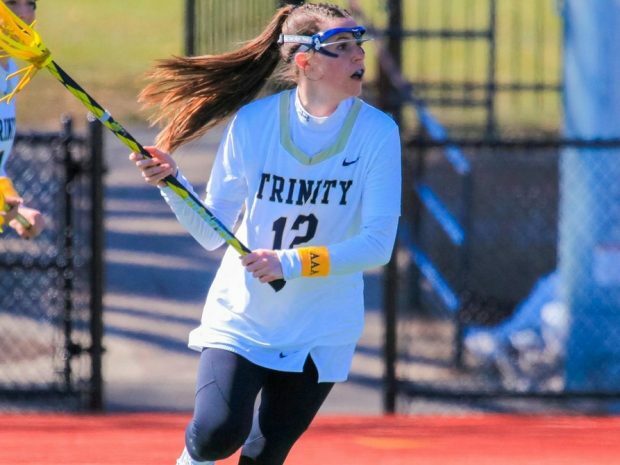 After traveling to Maryland and Pennsylvania for Spring break, the Trinity Women’s Lacrosse team returned to Hartford to take on the Bates College Bobcats. After an overtime loss to York College, the Bantams came in with fire in their hearts and ready to take down the Bobcats. Attacker Kiley Coffey ’18 began the scoring in the first 5 minutes with 2 goals, putting the Bantams in the immediate lead and setting the energy for the entire game. Coffey had 4 goals in the first half. Trinity ended the first half with a 6-2 lead, and those two goals were the only success the Bobcats would see against the Bantams. Trinity’s high intensity defense and strong offensive sets kept the momentum in favor of the home team. Eight different players scored for the Bantams against Bates. Goaltender Zoe Ferguson ’18 had nine saves, including the Bobcats only two free positions. 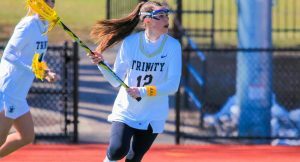 Trinity’s midfielders had crucial draw controls for the Bantams and Marcella Filbotte ’21 had a game-high of seven ground balls for the Bantams. Trinity ended with 13 goals and a 26-13 shooting advantage. This was an exciting win for Trinity as they moved to a 2-0 record in the NESCAC and a 4-1 record overall. The Bobcats fall to 0-3 in the NESCAC and a 3-3 overall. where former star defender Kathryn Delillio coaches as an assistant. The Bantams traveled to Medford, MA to take on the Jumbos, who had just come off of a loss to Washington and Lee. Trinity is ranked 4th in the nation, so opponents always play their best against the Bantams. Attacker Kiley Coffey and midfielder Annie Lyman ’20 both had 3 goals against the Jumbos and midfielder Allie Barrett ’18 had one goal and three draw controls. Trinity rookie Sophie Berger ’21 started off the scoring less than 3 minutes into the game with an assist from Barrett. Tufts responded strongly with a 3-0 run, spurring their energy and momentum throughout the first half. However, the Bantams counter-punched as Coffey scored two quick goals to tie things up. Going into halftime the Jumbos had an 8-5 lead over the Bantams. They extended their lead and their energy throughout the second half with fast ball movement and several scoring opportunities, ultimately finding the back of the net four times in the early minutes of the half. The Bantams, playing from an unfamiliar position, never let down, cutting the Jumbos lead to 2 with about 8 minutes left in the second half off of three consecutive goals. Tufts scored once more to seal their victory against the Bantams. Trinity takes on Springfield, Cortland and Bowdoin this week.